If you love the world-order and its things, the love of God isn’t in you. “All that is in the world-order” – what's included in “all”? “Evil eye” – idiomatic expression for stinginess, selfishness, greediness, miserliness, jealousy, someone who is a “taker,” not a giver. Proverbs 23:6 —Don’t eat the food of “an evil eye” (literal Hebrew), that is, “a selfish man” (NASB). Proverbs 28:22 —A man with an evil eye hastens after wealth and does not know that want will come upon him. Intro: Everything in Jericho was declared cherem, i.e., “devoted to destruction,” and what could not be destroyed was to be given to the treasury of the Lord. The Greek word used in the Septuagint (LXX) to render cherem is anathema (cf. 1 Corinthians 16:22 ). See Joshua 6:17-19 . Because Achan took the cherem, the items devoted to destruction, he himself was cursed with God’s curse of Jericho (a curse that wasn’t lifted until hundreds of years later – 2 Kings 2:19-22 ). If any person loves the world-system or the things in it, God’s love is not in him. The operative word is love, agapeo. Remember the context of the epistle: the goal is unbroken communion, a continual love-feast with the Godhead ( chapter 1 ). The concept of adultery means that James is casting our relationship with God as one of marriage. The “Archie Syndrome” – Betty or Veronica? Archie will have to make a choice one day. How faithful do you expect your spouse to be? 50% faithful? 75% faithful? 99% faithful? It’s impossible to be committing adultery and be faithful to a partner in a marriage. The impossible is impossible by definition. Adultery is the only allowable cause for divorce. Does God have grounds for divorce from you? Adultery is under the death penalty according to God. The price of following Jesus – “all that he hath” – Luke 14:33 (in the context of 14:25-35 ): Amplified Bible: So then, any of you who does not forsake (renounce, surrender claim to, give up, say good-bye to) all that he has cannot be My disciple. YOU CANNOT DO IT. 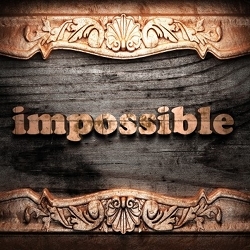 JESUS SAYS THAT THE IMPOSSIBLE IS IMPOSSIBLE. Doesn’t covet the world-system and its cherem. Is more than content with God alone, God Himself, counting intimate communion with Him of inestimable value. Kernels of Wheat Episode #16—If ‘God So Loved the World,’ Why Am I Not Allowed To? Previous post: 016 Kernels of Wheat – If ‘God So Loved the World,’ Why Am I Not Allowed To?